Banana - a berry. Banana plant - a large plant that does not have a solid stem. Banana stalk of grass sometimes reaches 10 meters in height and 40 centimeters in diameter. In one such stem hangs usually on 300 fruits weighing 500 kg. Bananas almost half as nutritious potatoes, and dried bananas to five times more calories than raw ones. 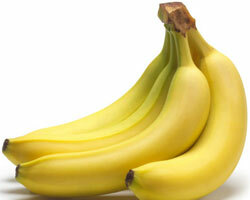 One banana contains 300 mg of potassium, which helps to fight high blood pressure and strengthens the heart muscle. Each of us a day requires 3 or 4 g of potassium.